Developer Orange Lake Resorts, operator of seven Holiday Inn Club Vacations® resort destinations, has announced that they are taking steps toward minimizing the impact of the company’s carbon footprint by introducing a new $1.4 million PulseFlow tunnel system by Pellerin Milnor Corporation that will save them 15 million gallons of water per year at their flagship Orlando resort. For nearly 30 years, Orange Lake Resorts has used equipment that processes 1,800 pounds of laundry per hour with 3 gallons of water used per pound, and completing the day’s work of 28,800 pounds of laundry over two shifts. Orange Lake’s new Milnor equipment consists of a PulseFlow Milnor CBW washer, a Single Stage press, and four pass-through dryers. The new equipment processes 4,000 pounds of laundry per hour, using only 0.3 to 0.4 gallons of fresh water per pound, with the day’s work of 30,000 pounds of laundry finishing in just one shift. The Orlando resort, with 2,478 villas and an average of 511,853 annual guests, processes eight million pounds of laundry per year. The new equipment allows the company the ability to grow their laundry operation to process up to approximately 10.5 million pounds of laundry per year. 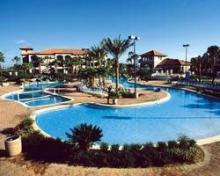 Orange Lake Resorts is a timeshare resort developer with nearly 30 years of proven success in the industry. Orange Lake’s flagship property in Orlando, located next to Walt Disney World® Resort, was established in 1982 by Holiday Inn founder Kemmons Wilson. A 1,450-acre golf, water park and sports resort, Orange Lake Resort in Orlando includes 2,478 villas with the ability to expand to 4,500 villas. Orange Lake Resorts is proud to be one of Orlando Sentinel’s “Top 100 Companies for Working Families” for the second year in a row, winning the Sentinel’s 2011 “Community Service Champion” award for excellence in philanthropic contributions.